smiles of several patients over the years; however, there are people who still believe that veneers will not help improve their smiles. 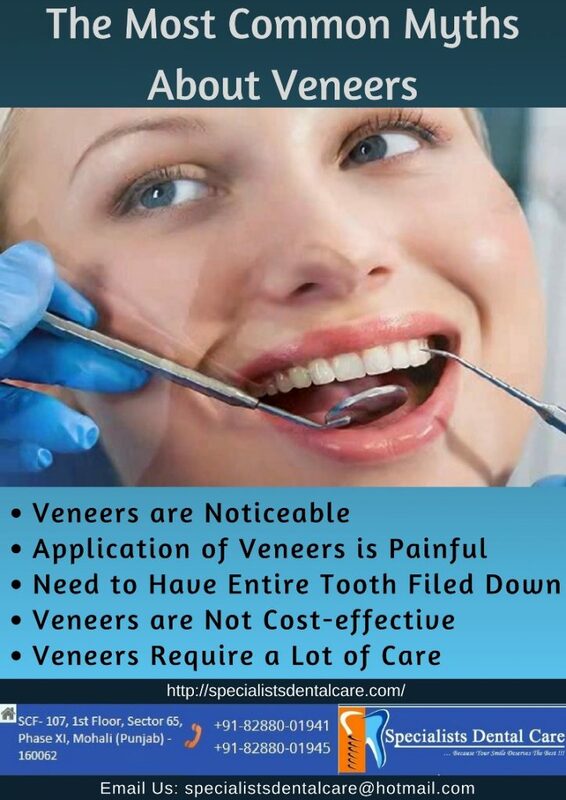 In fact, there are many myths about veneers that have made many people question this wonderful dental treatment. Fact: Dental veneers have come a long way over the years and are actually quite natural-looking as compared to other dental treatments. The improvement in technology has given veneers a more natural appearance. The colour, thickness, and shape are all customizable and blend seamlessly with the patient’s natural teeth. In most cases, veneers are not noticeable and help enhance one’s smile. Fact: You probably will not feel any pain while getting dental veneers, just like any other dental procedure, the patient is given a local anaesthesia, and sothey do not feel any pain or discomfort. The sensitivity is typically during the time a patient has to wear temporary veneers while the permanent ones are being made. Once the patient’s permanent veneers are placed, the sensitivity is usually eliminated. Fact: This is one of the most common myths surrounding veneers. Although there is some reshaping that is usually required before the veneer is applied, most patients only need a minimal amount. These days’ veneers can be made as thin as 0.3mm, so very less preparation is needed than in old times. You will just have to get a small portion of your enamel removed before you get your veneer replaced. Fact:Porcelain veneers often require a greater initial investment compared to other cosmetic treatments. However, they do the work of several treatments, such as teeth whitening, dental bonding, and orthodontics. They also allow you to improve the size and shape of your teeth, which you may not achieve with other solutions. Dental veneers provide fixed, long-lasting improvement, which means they offer a lasting, cost-effective solution. Fact: Dentists who provide dental veneers in Mohali and Chandigarh say that maintaining veneers is actually quite simple. They require care similar to your natural teeth with routine brushing and flossing using non-abrasive fluoride toothpaste. The toothpaste and toothbrush will be suggested by your dental professional. 1 week later after the procedure, you will be asked to come for a follow-up visit and evaluation. From the cost to the end result, if done right, dental veneers will give you that beautiful smile which you’ve always longed for. Schedule an appointment with the dental clinic in Chandigarh today to discuss if dental veneers are right for you or not. Readers please like and share this blog post and leave a comment below if you have any questions regarding dental veneers.